Whoever loves a friend consoles himself in some way for his absence by the sight of his portrait. He carries it with him, honors it and often looks at it. This is what the devout Lanspergius advises us to do with regard to pictures of the Heart of Jesus. "Having but little talent for representing objects to myself, I was extremely fond of pictures. Oh! How much those are to be pitied who lose, through their own fault, the help they might derive from them! It is evident that they have no love for Our Lord. For they would be glad if they really loved Him, to see His picture, just as persons in the world are glad to look on the portraits of those whom they love." "One day, on the Feast of St. John the Evangelist, after Holy Communion, the Heart of Jesus was represented to me as on a throne, formed of fire and flames, shedding rays on every side and brighter than the sun. 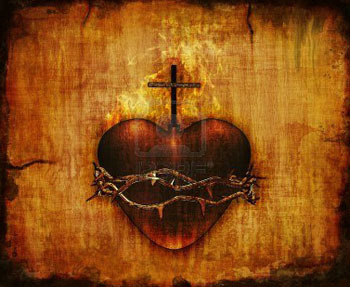 The wound which He received upon the Cross was clearly visible; a crown of thorns encircled the Sacred Heart, and it was surmounted by a cross. She adds: “My Savior assured me that He took a singular pleasure in seeing the interior sentiments of His Heart honored under the figure of this heart of flesh in the manner in which it had been represented to me, environed with flames, crowned with thorns, and surmounted by a cross. He said that He wished that this representation should be publicly exposed in order to touch the insensible hearts of men. “He promised me, at the same time, that He would shed in abundance the treasures of graces with which His Heart is filled upon the hearts of those who honored Him; and that, wherever this image should be exposed for particular veneration, it should draw down upon the spot every kind of blessing." It is said that the inhabitants of Antioch arrested a violent earthquake by writing the following words over the doors of their houses: Christus nobiscum: state! (Christ is with us: halt!) Let us bear upon our heart the image of the Heart of Jesus, and in all our temptations we may boldly defy the enemy of our salvation and say to him, The Heart of Jesus is with me! Halt! Practice - Bear about you a medal or picture of the Heart of Jesus and place one in your oratory. Do your best to have a chapel dedicated to this amiable Heart in the parish or country church where you reside. O Sacred Heart of Jesus, have mercy on us. O Immaculate Heart of Mary, pray for us. 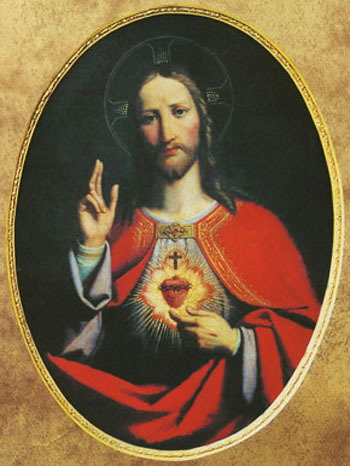 Any of the faithful who visits a picture of the Sacred Heart exposed for public veneration in a Church or Oratory or upon any altar, and prays before it for some time, according to the intention of the Sovereign Pontiff, gains each time an Indulgence of seven years and seven Quarantines, applicable to the souls in Purgatory (Pius VI, 1799).